Background: Gestational Diabetes Mellitus (GDM) is a major complication of pregnancy that can seriously affect the health of mother and fetus. sFlt1 and miR-19-5p have been proved to be involved in the complications of GDM. Our study aimed to investigate the effects of sFlt1 and miR-19-5p on the complications of GDM. Method: Pregnant women with GDM who gave birth to normal babies and babies with macrosomia, and Fetal Growth Restriction (FGR) as well as normal pregnant women were included. Levels of soluble fms-like tyrosine kinase-1 (sFlt-1) and miR-195-5p in prepartum serum and postpartum placental samples were detected, and level of sFlt1 in Human Umbilical Vein Endothelial Cells (HUVECs) transfected with miR-195-5p was also measured. Results: GDM pregnant women that delivered normal and FGR babies had higher levels of both miR-195-5p and sFlt1 compared with GDM pregnant women who delivered macrosomia babies or normal pregnant women. Transfection with miR-195-5p decreased expression level of sFlt1 and decreased level of p-VEGFR2 in HUVECs, leading to inhibition of VEGFR2-mediated neonatal angiogenesis. It was also confirmed that the placental blood vessel density was decreased, leading to FGR. Conclusion: MiR-195-5p can upregulate the expression level of sFlt1 to participate in the occurrence of FGR in GDM pregnant women. Gestational diabetes mellitus, Fetal growth restriction, Macrosomia, sFlt1, miR-195-5p. Gestational Diabetes Mellitus (GDM) is one of the most common complications during pregnancy. GDM is characterized by dysregulation of glucose metabolism with serious short- and long-term consequences to the mothers, fetuses, as well as new-borns . For example, the risk of Type 2 Diabetes Mellitus (T2DM) in women with GDM is seven times higher than that in women without GDM, and approximately 50% of women with GDM will develop T2DM within 10 y . GDM also participate in the development of some severe complications of the fetuses, including cardiomyopathy, hypoglycemia (low blood sugar), hypocalcemia (low blood calcium), hypomagnesemia (low blood magnesium), polycythemia (high hematocrit), hyperviscosity, polyhydramnios (excessive amniotic fluid), macrosomia (large baby sizes), Fetal Growth Restriction (FGR), neonatal respiratory distress syndrome, and even cognitive functions, possibly through unidentified epigenetic mechanisms [3-5]. Although there has been considerable controversy regarding the diagnostic criteria of GDM, it usually resolves after the delivery of infant [6,7]. Many risk factors, such as unhealthy diet and lifestyle, that may lead to GDM, which is reversible . The incidence of GDM is increasing in recent years. It has been reported that about 200,000 cases of GDM were reported in the US each year, and about 5-6% of pregnant women in China were affected by this disease . However, the molecular mechanism of GDM development is still unclear. Therefore, it is necessary to deeply investigate the pathological mechanisms of GDM to identify markers for the diagnosis. GDM has been also shown to be correlated to other adverse outcomes such as cesarean delivery and preeclampsia, which is a complication of pregnancy characterized by hypertension and hyperproteinuria . In 2003, Maynard et al. discovered that soluble fms-like tyrosine kinase-1 (sFlt1) was correlated with the occurrence of preeclampsia . Moreover, sFlt1 in maternal serum, along with andoglin and placenta growth factor, has been more and more used as early predictive markers for preeclampsia [12,13]. However, the potential correlation between GDM and sFlt1 has not been clinically investigated in depth. MiR-195-5p is a small non-coding RNA encoded by a gene of the miR-15 precursor family, which is an important set of regulators. MiR-195-5p has been proved to be closely correlated with the development of different human cancers and autism [14-17]. Recently, miR-195-5p has also been shown to be correlated to pregnancy-related complications, such as gestational hypertension, preeclampsia and intrauterine growth restriction [18,19]. Moreover, Sandrim et al. found that expression levels of miR-195-5p were correlated with levels of sFlt1 in preeclampsia patients [20,21]. In this study, pregnant women with GDM who gave birth to FGR, normal and macrosomia babies were studied serum levels of sFlt1 and miR-195-5p in those patients were compared with GDM pregnant women that gave birth to normal babies, as well as non-GDM pregnant women. We found that GDM-normal and GDM-FGR groups had higher levels of sFlt1 and miR-195-5p compared with GDM-macrosomia and control groups. Additionally, miR-195-5p transfection up-regulated sFlt1 and down-regulated p-Vascular Endothelial Growth Factor Receptor (VEGFR 2) in Human Umbilical Vein Endothelial Cells (HUVECs). Together, results in this study suggest that high expression level of miR-195-5p in GDM pregnancies may lead to elevated sFlt1 levels, thus inhibiting VEGFR2-mediated neonatal angiogenesis, resulting in intrauterine growth restriction. Ninety GDM patients with singleton deliveries in Beijing Obstetrics and Gynecology Hospital between January 2013 and November 2015 were selected. The mean age of those patients was 27.60 ± 4.30 y, and mean gestation age was 26.30 ± 3.20 w. Out of the neonates, 43 were born with normal sizes, 22 with macrosomia and 25 with FGR. The diagnosis criteria of macrosomia and FGR were based on Obstetrics and Gynecology Seven Edition by Le et al. Thirty normal women who delivered singleton babies at the same period were also selected as control, and the mean age of those participants was 26.80 ± 3.30 y, and the mean gestation age was 26.60 ± 2.20 w. Chronic diseases such as pre-gestational hypertension, diabetes, hyperthyroidism, hepatitis, tuberculosis, familial hereditary diseases, and history of tobacco or alcohol abuse were not found in all the participants. Before delivery, 8 ml of venous blood was collected from each pregnant woman. Each blood sample was divided in two tubes, 4 ml in each. One tube was coated with EDTA anti-coagulant, and this tube was frozen and kept at -80°C for subsequent assays. Blood in the other tube was used to collect serum. Serum was frozen and stored at -80°C for subsequent assays. After delivery, 2-4 placental tissues with a volume of about 1 cm3 were collected from the healthy part of the center of the maternal side. Half of these samples were stored in liquid nitrogen, and half were used for protein extraction, followed by Western Blot. Serum sFLT1 levels were detected using enzyme-linked immune-sorbent assay (ELISA) according to the manufacturer’s instructions (R&D systems, Minneapolis, USA). MiRNA was extracted from 4 ml of peripheral blood suing Serum/plasma miRNA extraction kit (DP503, Tiangen Biotech., Beijing, China) according to the manufacturer’s manual. Reverse transcription was performed, and cDNA was stored at -80°C for subsequent analysis. Reaction conditions for reverse transcription were: 30 min at 16°C, 30 min at 42°C, 5 min at 85°C, and 5 min at 4°C. The expression level of miR-195-5p was detected using a onestep qRT-Polymerase Chain Reaction method with EzOmics SYBR qPCR kit. This kit and primers of miR-195-5p and U6 were purchased from Biomics Biotechnologies Inc. (Jiangsu, China). The sequences of the U6 primer (used as an internal control) were: 5’- GTCCTATCCAGTGCAGGGTCCGAGGTGCACTGGATAC GACAAAATATGGAAC-3’ (stem-loop primer), 5’- TGCGGGTGCTCGCTTCGCAGC-3’ (sense), and 5’- CCAGTGCAGGGTCCGAGGT-3’ (antisense). The sequence of miR-195-5p was 5’- UAGCAGCACAGAAAUAUUGGC-3’, and the Negative Control (NC) sequence was 5’- UCACAACCUCCUAGAAAGAGUAGA-3’. Conditions of the RT-PCR were: 10 min at 95°C, 45 cycles of 15 s at 95°C, and 60 s at 60°C. U6 SnRNA was used as an internal control, and Ct values were calculated using SDS 1.4 program (Applied Biosystem, Foster City, USA). Data were processed using 2- ΔΔCt method. Human Umbilical Vein Endothelial Cells (HUVEC) were primary cells previously obtained by our group. They were cultured with EGM2 medium (CC-3162 medium, Lonza, Basel, Switzerland) in an incubator (37°C, 5% CO2). Cells were plated on a 6-wells plate at 90% confluence, with 1 × 106 cells in each well. The medium was changed to opti-MEM and incubated for two hours before transfection using Lipofectamine 2000 Transfection Reagent (Invitrogen, Carlsbad, USA). Four hours after transfection, medium was replaced by full medium. Vascular endothelial growth factor (VEGF; Peprotech, Rocky Hill, USA) was added 15 min before protein extraction. Total protein was extracted from placental tissues as well as HUVEC 48 h after transfection. Western Blot was performed using sFlt1, VEGFR2, p-VEGFR2, β-tubulin antibodies (Santa Cruz, Dallas, USA), and CD31 antibody (Sigma, St. Louis, USA). The intensity of bands was quantified using ImageJ (NIH, Bethesda, MD). Statistical analyses were performed using SPSS 19.0 program, and Student’s t-test was used for comparisons between groups. P<0.05 was statistically significant. Results showed that the GDM-FGR group and GDM-normal group had higher sFlt1 levels compared with Control group and GDM-macrosomia group (P<0.05). The highest sFlt1 level was found in GDM-FGR group (Figure 1A). GDM-FGR group and GDM-normal group also had higher miR-195-5p levels compared with control group and GDM-macrosomia group (P<0.05). The highest miR-195-5p level was found in the GDM-FGR group (Figure 1B). No significant differences in levels of sFlt1 and miR-195-5p were found between GDMmacrosomia and control group. Figure 1: sFlt1 and miR-195-5p levels in 4 groups of patients. GDMFGR group and GDM-normal group have significantly higher levels of sFlt1 and miR-195-5p compared with control group and GDMmacrosomia group, and the GDM-FGR group has the highest levels of sFlt1 among 4 groups. 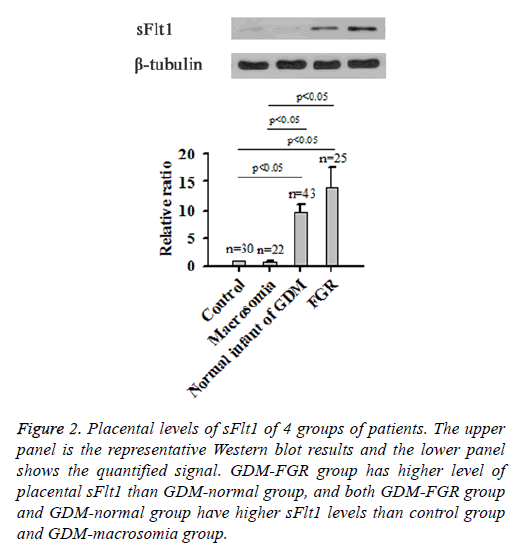 Results of Western blot showed that, similar to sFlt levels in peripheral blood samples, GDM-FGR group also had higher placental sFlt1 than GDM-normal group (P<0.05), whereas both two groups had significantly higher sFlt1 levels than Control group and GDM-macrosomia group (P<0.05; Figure 2). Figure 2: Placental levels of sFlt1 of 4 groups of patients. The upper panel is the representative Western blot results and the lower panel shows the quantified signal. GDM-FGR group has higher level of placental sFlt1 than GDM-normal group, and both GDM-FGR group and GDM-normal group have higher sFlt1 levels than control group and GDM-macrosomia group. RT-PCR results showed significant variation in miR-195-5p levels among the 4 groups. 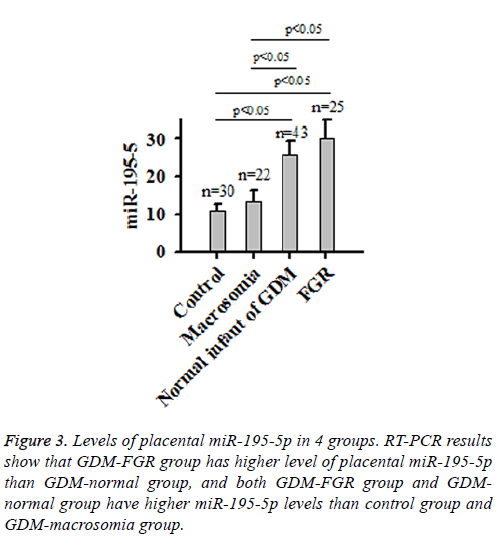 GDM-FGR group had the highest placental miR-195-5p level, followed by GDM-normal group, GDM-macrosomia group and Control group (Figure 3). No significant differences were found between GDM-FGR and GDM-normal group or GDM-macrosomia and control group (P<0.05). Figure 3: Levels of placental miR-195-5p in 4 groups. RT-PCR results show that GDM-FGR group has higher level of placental miR-195-5p than GDM-normal group, and both GDM-FGR group and GDMnormal group have higher miR-195-5p levels than control group and GDM-macrosomia group. 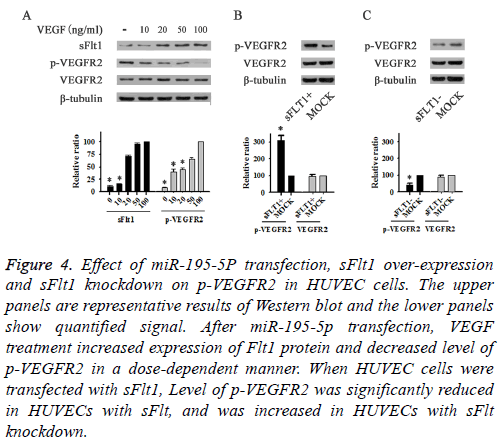 VEGF treatment increased expression level of Flt1 protein and decreased p-VEGFR2 level in HUVEC cells transfected with miR-195-5p in a dose-dependent manner (Figure 4A). Level of p-VEGFR2 was reduced in HUVECs with sFlt1 overexpression (Figure 4B), but increased with sFlt1 knockdown (Figure 4C). However, expression level of miR-195-5p was not changed in HUVECs with sFlt1overexpression, indicating that miR-195-5p was an upstream regulator of sFlt1 (Figure 5). Figure 4: Effect of miR-195-5P transfection, sFlt1 over-expression and sFlt1 knockdown on p-VEGFR2 in HUVEC cells. The upper panels are representative results of Western blot and the lower panels show quantified signal. After miR-195-5p transfection, VEGF treatment increased expression of Flt1 protein and decreased level of p-VEGFR2 in a dose-dependent manner. When HUVEC cells were transfected with sFlt1, Level of p-VEGFR2 was significantly reduced in HUVECs with sFlt, and was increased in HUVECs with sFlt knockdown. Figure 5: Effect of sFlt1 over-expression on miR-195-5p level in HUVEC cells. 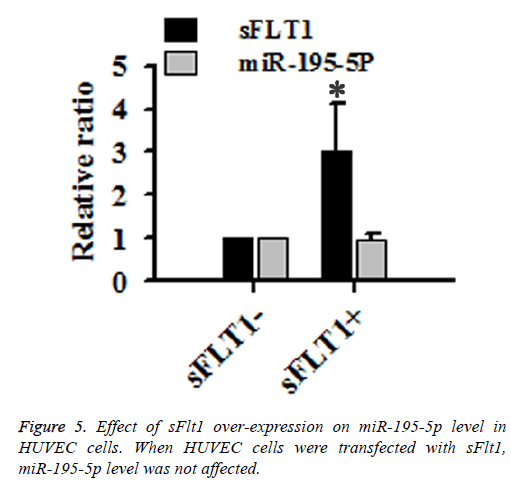 When HUVEC cells were transfected with sFlt1, miR-195-5p level was not affected. CD31, also known as Platelet Endothelial Cell Adhesion Molecule (PECAM-1), is a surface marker for neonatal blood vessels. Western Blot using total protein extracted from placental tissues of 4 groups of pregnant women showed that GDM-FGR and GDM-normal groups had significantly lower levels of placental p-VEGFR2 and CD31 than the GDMmacrosomia and Control groups, indicating lower angiogenic activity (Figure 6). 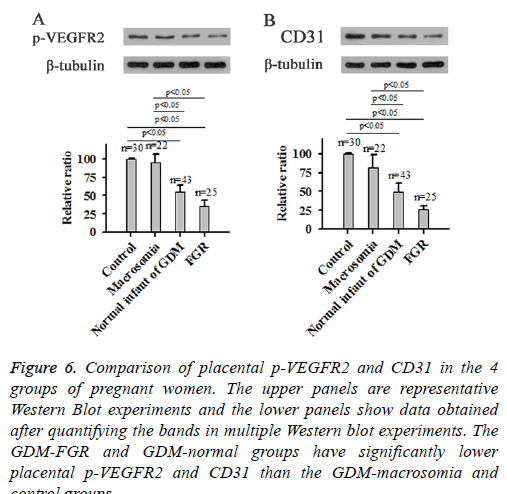 Figure 6: Comparison of placental p-VEGFR2 and CD31 in the 4 groups of pregnant women. The upper panels are representative Western Blot experiments and the lower panels show data obtained after quantifying the bands in multiple Western blot experiments. The GDM-FGR and GDM-normal groups have significantly lower placental p-VEGFR2 and CD31 than the GDM-macrosomia and control groups. GDM is a major pregnancy-associated complication, and it has a significant detrimental effect on the health of the pregnant woman as well as the fetus, GDM can cause various complications such as preeclampsia, macrosomia, and FGR . sFlt1 has been used as a diagnostic marker for preeclampsia, and has also been suggested to be correlated to GDM, but the mechanism of the function of sFlt1 is still unknown. MiRNAs are small non-coding RNAs that play critical roles in post-transcriptional gene regulation. As a miRNA with important biological functions, the expression level of miR-195-5p was reported to be increased in the development of gastric cancer , breast cancer , head and neck cancer  and hepatocarcinoma . In this study, the expression level of miR-195-5p was found to be significantly higher in GDM women who delivered normal or FGR babies compared with GDM women who delivered macrosomia baby and normal pregnant women, indicating the involvement of miR-195-5p in the development of FGR in pregnant women with GDM. Previous studies have showed that expression level of miR-195-5p is positively correlated with the level of sFlt1 in preeclampsia [20,21]. Consistent results were found in this study. In this study, miR-195-5p overexpression in HUVEC was found to be able to upregulate the expression of sFlt1 in HUVECs. In contrast, sFlt1 overexpression showed no significant effects on the expression level of miR-195-5p in HUVECs. Those data indicate that miR-195-5p may be an upstream regulator of sFlt1. sFlt1 is also called soluble VEGF receptor 1, or sVEGFR1. VEGF plays its biological roles by binding to one of its receptors. In has been reported that, VEGFR-2, which is one of the receptors of VEGF, has essential functions in a variety of biological processes such as wound healing, embryonic development and pathological angiogenesis . Both VEGFR1 and VEGFR2 can bind to VEGF . Therefore, the increased expression level of sFlt1 may compete with VEGFR2 to bind to VEGF, which in turn inhibitsVEGFR2-mediated angiogenesis in the neonates, leading to the occurrence of FGR. As placentas are the only channel that the fetuses obtain nutrition from the mother, an underdeveloped placenta leads to severe retardation in fetal development. Therefore, it can be reasonably speculated that a low placental blood vessel density may cause fetal malnutrition, and further leading to FGR in babies delivered by pregnancies with GDM. In addition, the normal placental blood vessel density in pregnant women with GDM, in which the glucose level is abnormally high, may cause over nutrition and lead to macrosomia. Thus, this study demonstrates a novel relationship between GDM, miR-195-5p, sFlt1 and fetal development, and inhibition of the increased expression level of miR-195-5p may point to a new direction for treatment of FGR in the future. Landon MB, Gabbe SG. Gestational diabetes mellitus. Obstet Gynecol 2011; 118: 1379-1393. Damm P, Houshmand-Oeregaard A, Kelstrup L, Lauenborg J, Mathiesen ER, Clausen TD. Gestational diabetes mellitus and long-term consequences for mother and offspring: a view from Denmark. Diabetologia 2016; 59: 1396-1399. Jones CW. Gestational diabetes and its impact on the neonate. Neonatal Netw 2001; 20: 17-23. Camprubi Robles M, Campoy C, Garcia Fernandez L, Lopez-Pedrosa JM, Rueda R, Martin MJ. Maternal diabetes and cognitive performance in the offspring: a systematic review and meta-analysis. PLoS One 2015; 10: 0142583. Ma RC, Tutino GE, Lillycrop KA, Hanson MA, Tam WH. Maternal diabetes, gestational diabetes and the role of epigenetics in their long term effects on offspring. Prog Biophys Mol Biol 2015; 118: 55-68. Bergel R, Hadar E, Toledano Y. Pharmacological management of gestational diabetes mellitus. Curr Diab Rep 2016; 16: 118. Meek CL. Natural selection? The evolution of diagnostic criteria for gestational diabetes. Ann Clin Biochem 2017; 54: 33-42. Zhang C, Rawal S, Chong YS. Risk factors for gestational diabetes: is prevention possible? Diabetologia 2016; 59: 1385-1390. Durnwald C. Gestational diabetes: Linking epidemiology, excessive gestational weight gain, adverse pregnancy outcomes, and future metabolic syndrome. Semin Perinatol 2015; 39: 254-258. Wendland EM, Torloni MR, Falavigna M, Trujillo J, Dode MA, Campos MA, Duncan BB, Schmidt MI. Gestational diabetes and pregnancy outcomes-a systematic review of the World Health Organization (WHO) and the International Association of Diabetes in Pregnancy Study Groups (IADPSG) diagnostic criteria. BMC Pregnancy Childbirth 2012; 12: 23. Maynard SE, Min JY, Merchan J, Lim KH, Li J, Mondal S, Libermann TA, Morgan JP, Sellke FW, Stillman IE, Epstein FH, Sukhatme VP, Karumanchi SA. Excess placental soluble fms-like tyrosine kinase 1 (sFlt1) may contribute to endothelial dysfunction, hypertension, and proteinuria in preeclampsia. J Clin Invest 2003; 111: 649-658. Hertig A, Berkane N, Lefevre G, Toumi K, Marti HP. Maternal serum sFlt1 concentration is an early and reliable predictive marker of preeclampsia. Clin Chem 2004; 50: 1702-1703. De Vivo A, Baviera G, Giordano D, Todarello G, Corrado F. Endoglin, PlGF and sFlt-1 as markers for predicting pre-eclampsia. Acta Obstet Gynecol Scand 2008; 87: 837-842. Gorur A, Balci Fidanci S, Dogruer Unal N, Ayaz L, Akbayir S, Yildirim Yaroglu H, Dirlik M, Serin MS, Tamer L. Determination of plasma microRNA for early detection of gastric cancer. Mol Biol Rep 2013; 40: 2091-2096. Luo Q, Wei C, Li X, Li J, Chen L. MicroRNA-195-5p is a potential diagnostic and therapeutic target for breast cancer. Oncol Rep 2014; 31: 1096-1102. Mundalil Vasu M, Anitha A, Thanseem I, Suzuki K, Yamada K, Takahashi T, Wakuda T, Iwata K, Tsujii M, Sugiyama T, Mori N. Serum microRNA profiles in children with autism. Mol Autism 2014; 5: 40. Summerer I, Unger K, Braselmann H, Schuettrumpf L, Maihoefer C, Baumeister P, Kirchner T, Niyazi M, Sage E, Specht HM, Multhoff G, Moertl S, Belka C, Zitzelsberger H. Circulating microRNAs as prognostic therapy biomarkers in head and neck cancer patients. Br J Cancer 2015; 113: 76-82. Hromadnikova I, Kotlabova K, Hympanova L, Krofta L. Cardiovascular and cerebrovascular disease associated microRNAs are dysregulated in placental tissues affected with gestational hypertension, preeclampsia and intrauterine growth restriction. PLoS One 2015; 10: 0138383. Hromadnikova I, Kotlabova K, Hympanova L, Krofta L. Gestational hypertension, preeclampsia and intrauterine growth restriction induce dysregulation of cardiovascular and cerebrovascular disease associated microRNAs in maternal whole peripheral blood. Thromb Res 2016; 137: 126-140. Sandrim VC, Dias MC, Bovolato AL, Tanus-Santos JE, Deffune E, Cavalli RC. Plasma from pre-eclamptic patients induces the expression of the anti-angiogenic miR-195-5p in endothelial cells. J Cell Mol Med 2016; 20: 1198-1200. Sandrim VC, Eleuterio N, Pilan E, Tanus-Santos JE, Fernandes K, Cavalli R. Plasma levels of increased miR-195-5p correlates with the sFLT-1 levels in preeclampsia. Hypertens Pregnancy 2016; 35: 150-158. Lu ZM, Lin YF, Jiang L, Chen LS, Luo XN, Song XH, Chen SH, Zhang SY. Micro-ribonucleic acid expression profiling and bioinformatic target gene analyses in laryngeal carcinoma. Onco Targets Ther 2014; 7: 525-533. Xu H, Hu YW, Zhao JY, Hu XM, Li SF. MicroRNA-195-5p acts as an anti-oncogene by targeting PHF19 in hepatocellular carcinoma. Oncol Rep 2015; 34: 175-182.